1. Which approach to assigning VLAN membership maximizes forwarding performance? CDP messages are only sent on VLAN1. 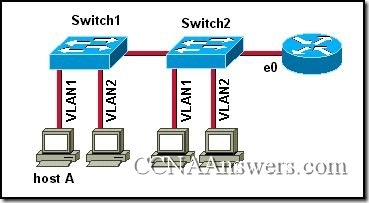 VLAN1 is reserved for links between switches. All switch ports are members of VLAN1. VLAN1 must be created before ports can be assigned to it. Only switch port 0/1 is assigned to VLAN1. An IP address configured on the switch will only apply to ports on VLAN1. If the source is unknown, the source port is shutdown. If the source port of a frame is unknown, a bridge will issue an ARP request. If the destination is on another segment, the bridge forwards the frame only to the correct interface. A bridge forwards frames for unknown destinations to the default gateway. If the destination port is unknown, a bridge will flood the frame to all ports in the broadcast domain, except for the source port. If the destination of the frame is on the same segment as the source, a bridge will not forward the frame. Reboot the switch in order for the changes to take effect. Use the negative form of the command that was used to create the VLAN. Reassign the switch ports from the deleted VLAN to other VLANs if they are to be used. Use the erase vlan command in global configuration mode. Delete the vlan.dat file from flash. The router IOS does not support trunking. The port is connected and is not receiving alignment and FCS errors. The switch duplex and speed are not set properly. The router and switch are running different versions of STP. The switch IP address is incorrectly configured. 6. 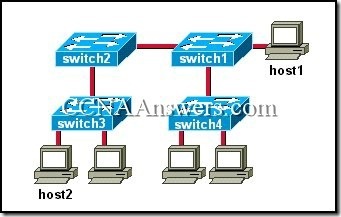 If two 12-port hubs are connected to a switch that has three VLANs configured, how many bridging tables will the switch maintain? 7. A network administrator has configured a switch with VLANs. Hosts will join the VLANs based on their MAC or IP address. What type of VLANs have been configured on the switch? 10. 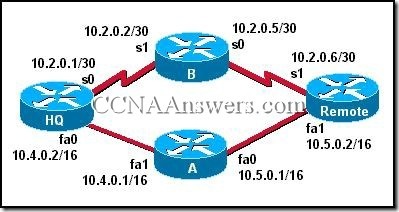 Which of the following states the 80/20 rule of end-to-end VLANs? 80% of network resources should be remote and 20% should be on the local VLAN. 80% of VLANs should be static and the remaining 20% should be dynamic. 80% of network traffic should be local and 20% remote. 80% of the network sources should be centralized at the core layer and the remaining 20% at the distribution layer. 80% of traffic should be routed and 20% should be switched. 12. A network administrator has just finished configuring a switch with multiple VLANs. A workstation on VLAN2 cannot communicate with a workstation on VLAN3. What needs to be done to correct this problem? The traffic needs to be routed between the two VLANs. The hosts must be reconfigured to be on the same logical network. The VLANs need to be configured to be on the same broadcast domain. The switch must be configured to share VLAN traffic. Workstations, departments, and network resources are seldom moved. VLAN port membership frequently changes. Robust VLAN management software is available to the network administrator. The overhead required to manage VLAN MAC address and custom filtering tables is not desirable. VLANs are often added, deleted, and modified. 14. VLAN 10 needs to be removed from a switch. Which command must the administrator enter in order to accomplish this task? Refer to the network shown in the graphic. Host A on VLAN1 has sent a message requesting the MAC address of its default gateway. Which of the following network hosts will process this message? The message will be seen by the hosts on VLAN1 and VLAN2. The message will be seen only by the hosts connected to Switch1. The message will be seen only by the hosts connected to VLAN1 on Switch1. The message will be seen by the hosts connected to VLAN1 on Switch1 and Switch2. The message will only be seen by router interface e0. 16. If a switch connects 12 collision domains and is configured with three VLANs, how many broadcast domains does it have? 18. Which of the following commands will assign switch port 0/9 to VLAN3? 19. What does a switch do when it receives a frame and the source address is unknown? The switch will discard the frame. The switch will request the sender resend the frame. The switch will map the source address to the port on which it was received. The switch will flood the frame to all attached devices. The switch will issue an ARP request to confirm that the source exists. The frame header is in its original format when it reaches the endpoint device. The VLAN membership of frames does not need to be identified unless ISL is in use. The Ethernet frame is encapsulated or modified with the VLAN ID information. The VLAN ID is removed by the endpoint device upon delivery of the frame. The root bridge timers control BPDU traffic on the network. Only the show commands on the switch can display root bridge information. It is the central point of a spanning tree topology. Storm control is enabled by default. VLANs cannot be trunked between switches until the root bridge has been elected. 23. Switch-A and Switch-B are both configured with ports in the Marketing, Sales, Accounting, and Admin VLANs. Each VLAN contains 12 users. How many different subnetworks will be needed to enable routed connectivity between the VLANs? 24. What happens to the member ports of a VLAN when the VLAN is deleted? They default back to the management VLAN. They automatically become a part of VLAN1. They must be assigned to another VLAN before the original VLAN can be deleted. They remain a part of that VLAN until the switch is rebooted. They then become members of the management VLAN.